Blazblue Chrono Phantasma Extend finally comes to our European shores after initial releases in Japan and the US. We checked out the PS4, PS3 and Vita versions of one of 2015’s best fighters. We actually looked at the PS4 version a while ago when it came out in the US, and you can still find that review here. In a way, the PS4 is the odd one out in the lineup this time, because it’s the only platform that didn’t get the base Chrono Phantasma game prior to the “Extend” release. This makes the “Extend” version much more of an obvious choice for PS4 owners when you compare it to PS3 and Vita owner who might already own the original game, and for that reason we’ll focus mainly on the PS3 and Vita editions in this review even though the majority of what we discuss here also covers the PS4 version. Both the PS3 version and the Vita version come fully featured (when compared to the PS4 edition), which is no small feat especially for the Vita. The “price” to pay comes in the form of some hefty download sizes, with the game weighing in at 3.1GB on the Vita and 12.5GB on the PS3. BlazBlue Continuum Shift Extend on the Vita is just about the same size though, so Arc System Works fans knew what to expect. And they’re not likely to be disappointed either, since Chrono Phantasma Extend is quite possibly the most complete package you can find in the beat ’em up genre. Game modes are so copious that they’re not even listed in the main menu, but rather categorized to make things a bit more manageable. Under “practice”, you’ll find tutorial, training and challenge modes – and they’re all vastly different. The tutorial is especially noteworthy, because it’s a bit like playing a separate mini story mode. Aside from just teaching you the basis controls, the game also draws you in by having fully voiced characters explain more about the dynamics behind the fighting and adding a lot of personality to this mode by alternating teachers for different sections of the tutorial. As mentioned in the PS4 review, Chrono Phantasma Extend features a LOT of story/background content. If you’re used to arcade modes in fighting games, then you know you can beat most of them in under half an hour once you get good at them. 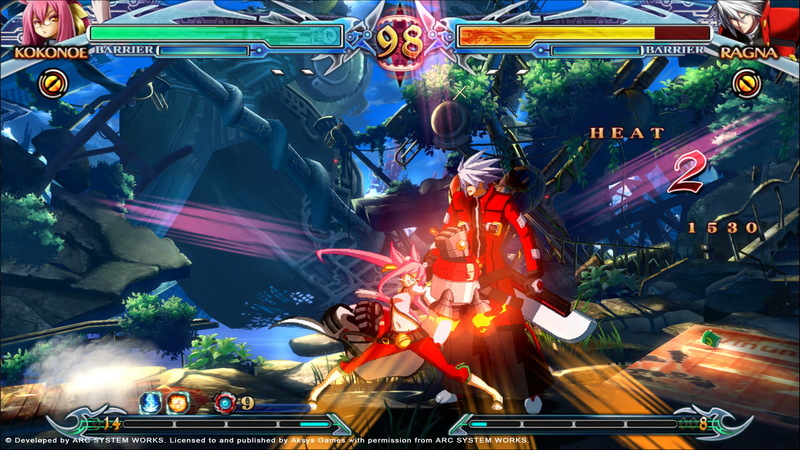 BlazBlue has such a (straight up arcade) mode as well, but the story mode is a different beast altogether. Here – the action is fleshed out immensely through heavy use of cutscenes and dialogue, which offers up a crazy and fun narrative that’s worth following even if you’re new to the franchise. You’ll most likely only do this once, but the game also offers alternative ways to experience the story through alternative/extended story modes. The amount of content is almost daunting, but there is great value for money here. The gameplay itself can be as accessible or challenging as you want, and Chrono Phantasma Extend takes a bit of a different approach to the difficulty level. We really liked that when less-skilled players took to the controls, they had the option to select simplified controls. 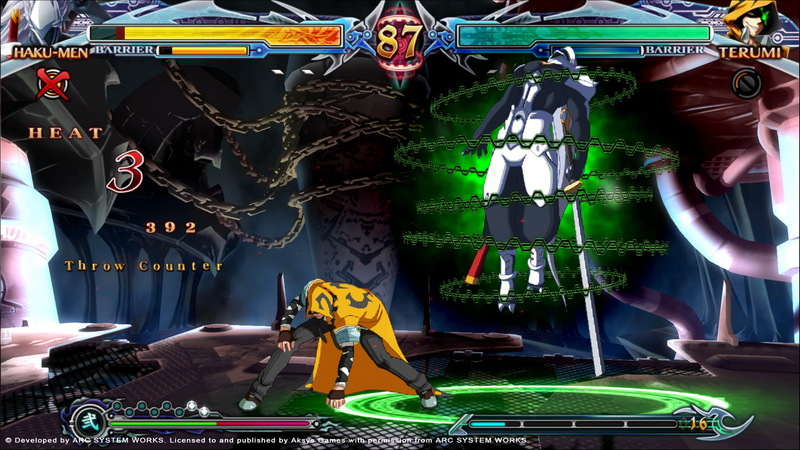 This means that they can still pull off amazing-looking combos and moves, despite lacking the skills that BlazBlue veterans might have. Of course this type of advantage doesn’t work (and isn’t available) in player versus player battles, but it makes the story mode much more enjoyable for rookies. A great compliment for the PS3 version is that it can sit side by side to the PS4 version easily – it looks great and at first glance there are very few differences between the two versions. The framerate (although lower) is still very smooth, the characters colorful and crisp – and the story presentation as excellent as ever. For the most part, the same can also be said for the Vita version, although it’s easier to tell where some of the corners were cut to make this game shrink down to an acceptable size. This can be seen especially within the story content – the tremendous amount of audiovisual content there must have been a challenge to shrink down but we’re glad everything made it and that the developers didn’t choose to scrap some of the content instead. Load times on the Vita are (traditionally) a bit long, but the excellent audiovisual presentation helps here – you won’t be staring at any plain screens with a “loading…” message here. If you’re a loyal PS3 or Vita owner then there’s no question if this game is worth it – with the upcoming Street Fighter game skipping these platforms this is quite possibly the best fighter you can expect anytime soon. Existing Chrono Phantasma owners might be a bit hesitant when it comes to grabbing the “Extend” version, but fighting fans who didn’t grab the original game have no reason to overlook this game.